A Bupa team day has turned into a community focused working bee. 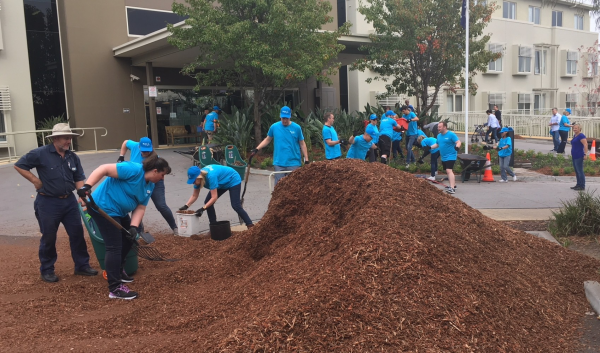 The gardens at Bupa Clayton Aged Care Home in Melbourne were in need of a makeover and a team from the company decided to do something about it. “We wanted to help bring something a little extra to the Clayton residents with some fun activities and a walk or two; along with brightness and colour at the front entry to Bupa Clayton with a revitalised garden,” said Liam Metzeling, compliance monitoring officer. The risk and compliance team had more than 20 people attend the working bee. “It was a really inspiring day. The team at Clayton do the most amazing job and we were honoured to be able to help them,” said Lorna Stewart, Bupa’s chief risk officer. The team split into an inside crew that spent time with the residents and an outdoor crew to help with landscaping. “Our interactions with the residents were great and it was fantastic to meet some our incredible aged care staff that are so dedicated to making the lives of the residents as comfortable and enjoyable as possible,” said Mr Metzeling. “It was great to see everyone working together to give back and interact with the residents. They achieved everything they set out to do and it was ultimately the perfect result all round,” said Duncan Luc, Bupa regional asset manager.